Rabbits just like dogs and cats are one of the best indoor companion animals. They can be house trained and if given the proper attention and care can live as long as 10 years or more especially when they live in an indoor rabbit hutch. They hardly make any noise, they only mumble and thump their back paws on the floor when scared. They are the perfect pet for apartment dwellers as they are silent animals. Bunnies also enjoy getting petted; they love their heads being gently stroked, patted and scratched. Similar to dogs, they are also very curious about their surroundings as they love to run and hop in and out of every room in your homes. More people nowadays find out that rabbits are wonderful alternatives to cats and dogs as pets. They are adorable animals safe for kids too. 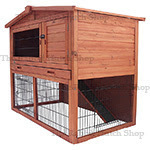 If the house is small to accommodate an indoor cage, outdoor rabbit hutches made of frame constructed wood with a combination of wood and wire mesh floorings can be place directly outside the house, in the garage or in the yard as long as there is enough ventilation and protection fit for all weather. The cage size may be built according to the number of bunnies and filled with straw for their warmth and comfort. These small animals also tend to chew on things and will gnaw on your home furniture, thus they should not be allowed to hop and run free unsupervised. Domestic rabbits should be safely housed in hutches to provide them protection in cases when you cannot be with them while you and your family are away. There are several rabbit breeds available in pet shops depending on your choice and preference. They are delightfully quiet, can be easily cared for, can be litter box trained since they prefer to be clean, the reason why they are excellent indoor pets.